Lift your spirits with Goddess Garden's happiness-boosting essential oil blend, featuring certified-organic citrus oils like bergamot and grapefruit. This therapeutic essential-oil blend is paired with organic jojoba oil, so it’s gentle enough to reapply anytime you need extra joy and levity in your life. 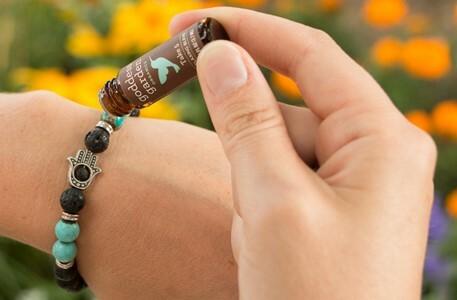 Created specifically to make it easy to enjoy aromatherapy on the go, the Aromatherapy Bracelet Blends enhance the benefits of the Aromatherapy Bracelet stones. The unique essential-oil Bracelet Blends come in a custom bottle designed to deliver the precise amount of oil. 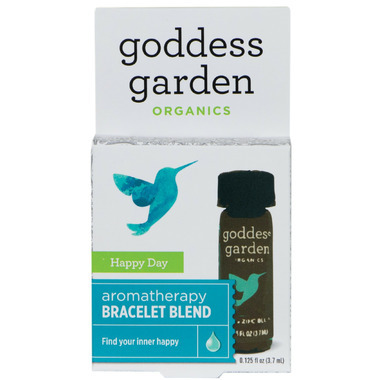 Try Happy Day with Goddess Garden's Ambition Bracelet, mix and match, or use multiple bracelets and oil combinations to boost your mood and enjoy the therapeutic combo! Ingredients: Organic Bergamot Oil, Organic Grapefruit oil, Organic Lime oil, Organic Palmarosa Oil, Organic Jojoba Oil.